Hot time, summer in the city… Park City, that is! Despite some of the best weather this side of the Mississippi, Park City does have its dog days in the summer. Luckily for us, there are some very cool options for keeping the heat at bay. As temperatures rise, Parkites and visitors can take a short 20-minute drive to either the Provo River or the Weber River for some river fun. You can raft and tube on both rivers and even paddle board on one. The question then becomes, how wet do you want to get? 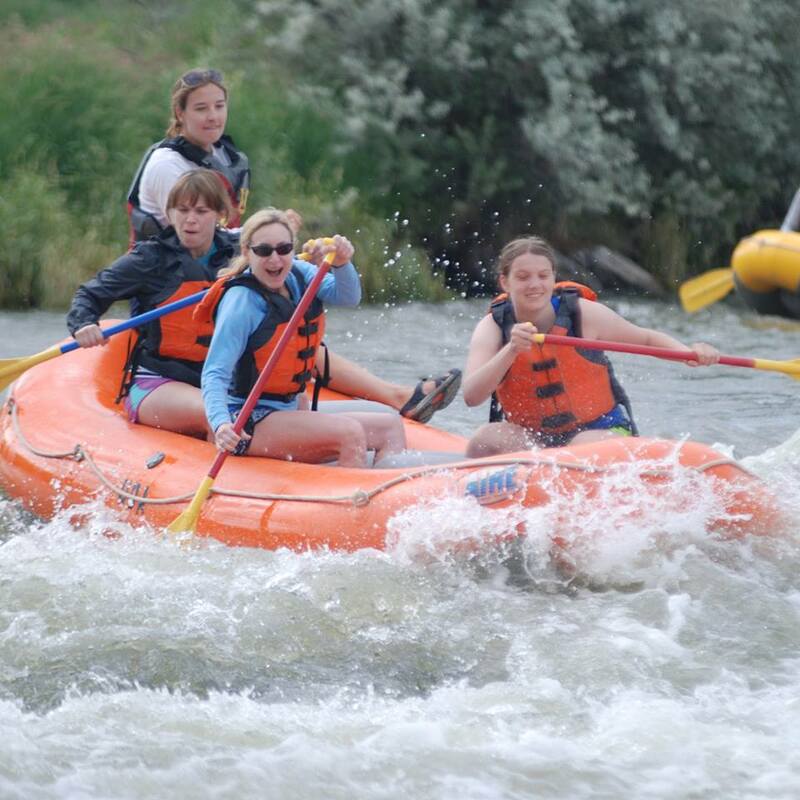 An afternoon rafting on the Weber River is a fantastic summertime activity. Depending on water levels, a trip can take about 2 hours, plus drive and shuttle time. For the true adventure seeker, longer half-day trips are possible. The Weber feels like Park City’s secret backyard. It cuts through a dramatic red rock canyon with fascinating rock formations, arches and caves. After the canyon is the unique Devil’s Slide, one of the most unique rock formations in all of Northern Utah. Just downstream is Croyden’s wave, a popular play spot for kayakers and a sure bet for a good splash! With a mix of level I and II rapids, there is plenty of fun for everyone, even children and groups. The excitement comes with the mellow rapids and rock gardens. Then there are plenty of calm stretches in between to check out the scenery and wildlife or have a water fight with your boat-mates. Keep your eyes peeled for signs of a rich locomotive history throughout the region, hidden arches and more. You will also notice a lot of tubers on this river. It’s definitely more of a thrill, with natural obstacles such as rocks, trees, branches and bridges. It’s a good option for strong swimmers, thrill seekers and those who don’t mind a cold bum. The Provo offers a memorable river experience with big time scenery. Located in Provo Canyon, you will see steep canyon walls and gorgeous waterfalls. The river is below the majestic Mt. Timpanogos, towering a whopping 11,750 feet above. The Provo Canyon stretch of river is filled with swift water and moderate rapids. Most floats last 2 to 4 hours, depending on vessel and beach stop time. This is a perfect activity for a small group, a family or a large group, as long as they’re up for cool mountain water on a hot day. Similar to the Weber, I have seen a variety of vessels—from grocery store blow up tubes to inflatable mattresses—on the Provo. As comical as those are, I recommend buying a high quality river tube or renting a custom-made, heavy duty tube from one of the local vendors, which includes a life jacket and shuttle. SUPs can also be used on the Provo, although I haven’t done it myself. (If you have, please comment about your experience below). There are many commercial rafting outfitters on both rivers and I have had good experiences on both rivers. The plus is that you don’t need your own equipment and you get a ride up the river. I kayaked down the Provo river which was a bit more active than rafting and lots of fun. If you’re a drinker, please be responsible. The sun and alcohol can be a bad combination, and the river is not the place to get out of control. If you do plan to drink, please don’t drive. Please don’t litter our beautiful, scenic rivers. Be respectful of others enjoying the river, including fishermen. We have plenty of amazing adventure guides in Park City that would be happy to take care of your shuttle, vessel, safety equipment and sometimes even lunch. Consider making it easy on yourself and hire a guide. Don’t forget life jacket, sturdy sandals and sunscreen. Waterproof camera is optional but highly recommended to capture these memories for a lifetime! The summer season in the mountains is short so don’t waste any time making a splash on these magnificent rivers.